While fleeing the law in Depression era Chicago, Harper Curtis stumbles upon the key to a derelict house with magical properties. Despite its outward appearance, the inside of the house is one of grandeur (well, except for the dead body in the hallway, but real estate being what it is during the Depression, one can't be too picky). There's a stash of cash and a haphazard collection of kitschy objects from different time periods, but that's not the only secret hidden by this house--it is also a portal to the past and the future. As Harper explores the house, it speaks to him and it becomes clear that he's been drawn here for a purpose. He must seek out "The Shining Girls," women from different times and different walks of life who must die by his knife. So, serial killer stories aren't normally my thing. I'm not particularly intrigued by how a psychopath's mind works, never really interested in his methods and his madness, and I find the whodunit aspect of most of these novels tiresome. But I found that I couldn't ignore the hype surrounding The Shining Girls. The promise of a serial killer who could travel through time and disappear without a trace? Now that is certainly something that I've never read before and it appealed to the part of me that enjoys science fiction. I thought there might be something new and inventive here--something that might help it rise above others of its ilk. However, it proved to be disappointingly, well, average. Harper Curtis is a casebook psychopath, complete with a childhood history of torturing animals and an inability to empathize with others. In terms of character, there's very little to distinguish him from other literary serial killers--he's fairly bland in comparison to, say, a Hannibal Lecter. Harper's only distinction is provided by the house itself and, unfortunately, the house only serves as a vehicle for Harper. An inventive premise, to be sure, but it's ultimately as riveting as knowing the make and model of the vehicle a killer might use to get from one place to another. Its origin is never explained and its role in the events that transpire is never really clear. The hunt for Harper is led by the only woman to have survived his brutal attack, Kirby Mazrachi. Kirby is an appealing and interesting character. She's strong, quirky, and hellbent on finding the man who did this to her. As a means of doing so, she becomes an intern for a former criminal reporter, Dan Velasquez, at the Chicago Sun-Times. While he's now on the sports beat, Kirby hopes that she can convince him to help her gain access to files and reports that might help her track down the man who left her for dead. Kirby's investigations seem a little slapdash, moved along by heaping dollops of happenstance and coincidence that fall too neatly into place. I loved Kirby's headstrong nature, but to all those who compare this novel to The Girl With the Dragon Tattoo I must point out that a few punk rock t-shirts and a nose ring do not a Lisbeth Salander make. As it weaves back and forth through time, the novel alternates its chapters between Harper, Kirby, Harper's other victims (whose stories, while poignant, aren't as fleshed out as I would have liked them to be), and a few minor characters. The chapters read quickly, but all of the back and forth through time caused it to lose some momentum and suspense for me. By the time the denouement occurs, it is, despite all the weirdness that leads up to it, fairly average and not much different from the resolution one might expect in a more traditional serial killer narrative. 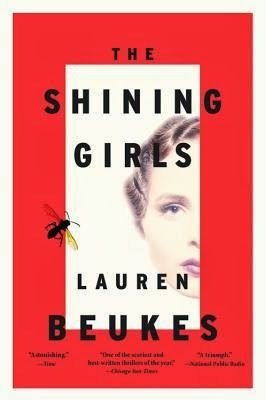 There's no doubt that Lauren Beukes has an interesting idea behind The Shining Girls, but it never really delivered for me. Her writing is serviceable and occasionally finds moments of beauty, profundity, or wit; I particularly enjoyed the chapters focusing on Dan, a middle-aged man who knows he's falling for the much younger and damaged Kirby. Beukes hit the right note of guilt, longing, and restraint in his internal monologues. Despite its strong female protagonist and its creativity, I can only say that I liked the book but never truly fell in love. "But primal dreams have made me wise..."